If you are right in the process of organizing your wedding ceremony, then you should check out this post. What you find below will by all means simplify your life and make the preparation process more smooth and perfect. It is not a secret that one of the most important choices a bride has to make is a wedding dress. Without a right gown your big event will get spoiled no matter what you do. Hence, it is quite reasonable to first come up with your astonishing outfit and only then move to the next step. If you are still unsure about the fit and style of your dream dress, scroll down and you will get as much inspiration as one can only think of. Read on to fall in love with the 7 of the most gorgeous open-back wedding gowns. 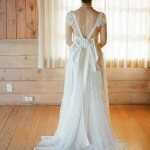 Here is one of the most delicate and elegant wedding gowns that I have ever seen. This astonishing piece is designed for those ladies who prefer sophisticated fits. Such a dress does not feature any excessive embellishment or extra details – and this is the best part of it. You can be sure that if you rock such a number, all the guests of your party will be amazed and fascinated. The very view of your perfect back will not leave a single person untouched. If you are a fan of lace and embellishment, then you will definitely love this beautiful dress. The exquisite embroidery in transparent lace leaves a large part of back open to the view. Yet, it also gives some mystery as the back design covers the shoulders and flows into the sleeves. The style of the skirt corresponds with that of the bodice, creating an excellent combination which is extremely hard to resist. Unique designs are always quite popular among the brides. Such styles attract even more attention to the bride and make the attendees of the ceremony remember the couple for quite a long time. This dress in delicate cream stresses one’s slender and precious back, while the two diagonal strips of fabric create a very unusual embellishment. The lace sleeves along with the impressive bow add up to the overall impression and make one totally fall for the number. If you like the previous dress but consider the bow and lace to not fit into the outfit, then here is something that you might like. A lovely gown in ivory is designed in such a way that one will find it very hard to resist its power. It still features a pair of stripes that create a very cute intersection. You will also spot a bow on the back; yet, this time it is much smaller and way more moderate. This way the largest portion of attention will be drawn to your beautiful back other than to the styling elements. For those of you who are in deep love with various crystals, gemstones and rhinestones, there is a stunning piece of wedding clothing that you will immediately fall for. Why to leave your back simply open, when you can beautify it with a myriad of sparkling and glowing items? This high-skimming mother-of-pearl dress features super slim spaghetti straps that are combined with magnificent design encrusted with a thousand of beautiful crystals. Such a dress will definitely make everyone stare at you in excitement and admiration. In case you are not fond of embellishment at all and would like to keep your back as open as it is possible, here is another lovely outfit to make you happy. This strapless number in white features an impressive zipper along the back as well as a multi-layered ruffled skirt. Other than that you won’t spot any styling elements – which by all means makes the dress very alluring and desirable. Last but not least comes a very precious and delicate piece of wedding wear. This beautiful gown in cream is styled in rich atlas with a layer of embroidered tulle over it. The embellished lace V-cut along the back adds an elegant and alluring zest to the frock, while the moderate tail makes the number more chic and appealing. Any of you will totally rock in such an outfit, as it is full of high style and sophisticated touch. These were the most adorable and fascinating wedding gowns that feature an open back. Whichever one you choose, just keep in mind that you ought to have your hair in a bun or something similar to it. Otherwise your beautiful back will be hidden from the eyes of people around.